I just found this article from the D.E.C. I had no idea the DEC was doing this: selling native trees to home owners and schools at a discount to encourage growth of appropriate habitat trees or plants for our region. This tree nursery is located on Route 50 in Saratoga, heading toward Ballston Spa. I’m happy to act as liason between the DEC tree nursery and Saratoga gardeners. Planting native trees is one of my favorite parts of this business. 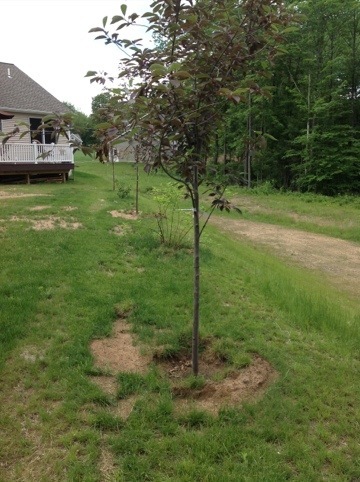 Shown in the photo is a line of Red Chokeberry trees I planted this spring for a Wilton home owner, perhaps a half mile from the Wilton Wildlife Preserve. The Red Chokeberry has a special habitat niche in the Wilton/ Saratoga area. It actually grows well in sandy soil, which this region is abundant in. The Chokeberries are eaten by the birds in the fall and winter.